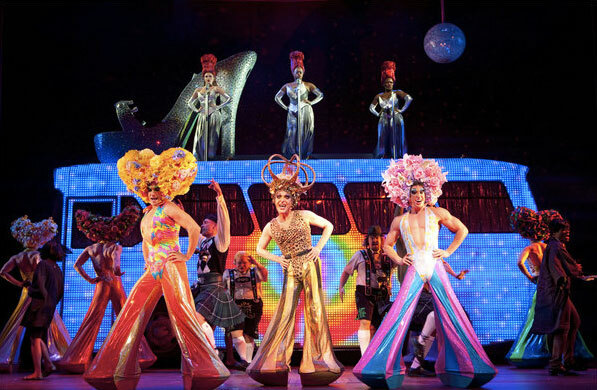 Priscilla Queen of the Desert opened on Broadway on March 20 to very mixed reviews. Most critics agree that is show is made of fabulous fluff, but some were left wanting more, while others were carried away by the elaborate glitz. Have you seen the show? What did you think? experience, skip this. If you want to walk out of the theater singing and feeling good, don’t miss this. Love nick adams! The best evening of disco, dancing and pseudo-dames you could ever want. I enjoyed every minute of it and would go back tomorrow night, if I could get tickets. The critics need to sit back and enjoy the show. Tremendous costumes, staging, choreography and actor enthusiasm will keep this production around for a long time. Provecho!! It was the most fun, beautifully spectacular show I have ever seen – and if I still lived in Manhattan I would go every weekend! Question: Does anyone know where to go get any discounts for Priscilla? Do they do student rush or lotto? I’m coming in from NC and have been dying to see it. I’ve been hunting for some cheap Orchestra seats everywhere…Thoughts?